Katie Coston founded Illyria Pottery in 2008, after studying Art Education and 3-Dimensional Studio Art in Greenville, South Carolina. She now lives and works in Oxford, England, running a successful shop right above her studio where she single-handedly makes all of her beautiful products. 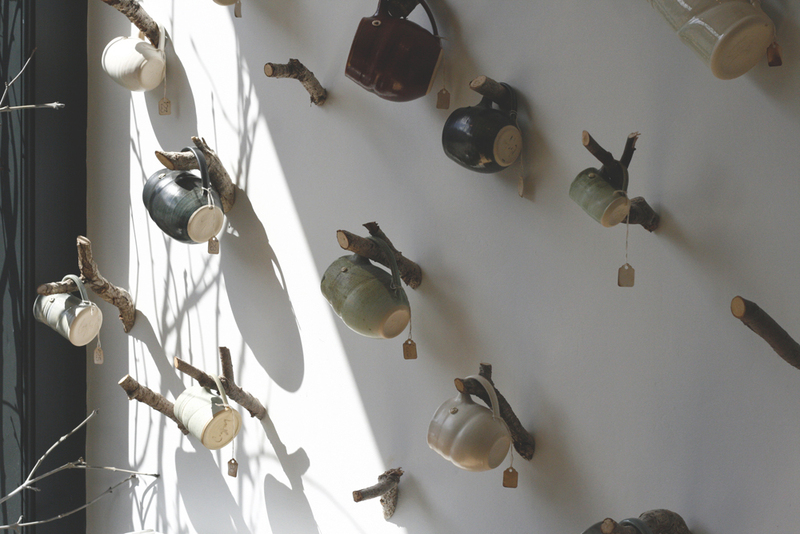 We talked to her about her craft, and life as a thriving small business owner. Hello Katie, we love your work. Can you tell us how Illyria Pottery got started? This business started in in Greenville, South Carolina in 2008 and moved to Oxford in the UK 5 years later. In the beginning, it was a kind of natural progression from my work when I was studying. In undergrad I fell in love with clay. 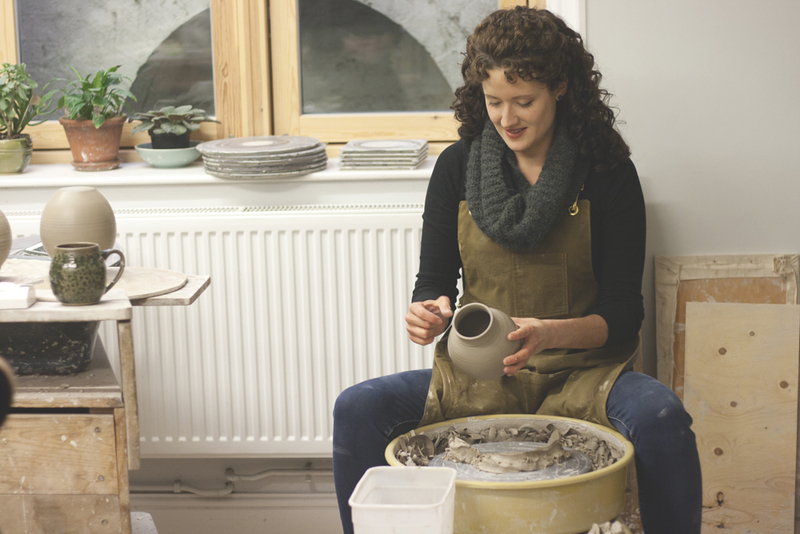 But I still wasn’t picturing myself as a potter at all – I didn’t know anyone who was a full-time potter. I started making pieces, stayed on studying in South Carolina, did a Master’s degree there, and I was teaching undergraduates as a [teacher’s assistant]. As I was making projects, I started realising that the things I was making were selling – that’s how the business began. Were there any challenges you have faced setting up a small business? It was hard, and interestingly it was harder in the UK than in the US. I think there’s a lot more pessimism and a lot more expectation of failure here, whereas people back at home would say go for it – that can-do attitude is apparently very unique to Americans. Illyria is such an evocative word – where did the idea for the name come from? Illyria is the pre-Roman province across the Adriatic, a region in the western part of the Balkan Peninsula. The Illyrians used a lot of pottery in everyday life and I liked that connection. However, I think I actually chose the name before I knew much about what it meant, I liked the word just by the sound of it – and I hoped that the pieces I make would mimic that lyric quality. What would you say makes Illyria special? I think it is special because it is just two hands making everything. I don’t think there is a lot of that. I feel there is a personal nature to the business that comes through to people. Everything has been made just downstairs, it’s all happening in-house and there is a really great energy to that. I also hope that my pieces are beautiful objects that people will enjoy using. 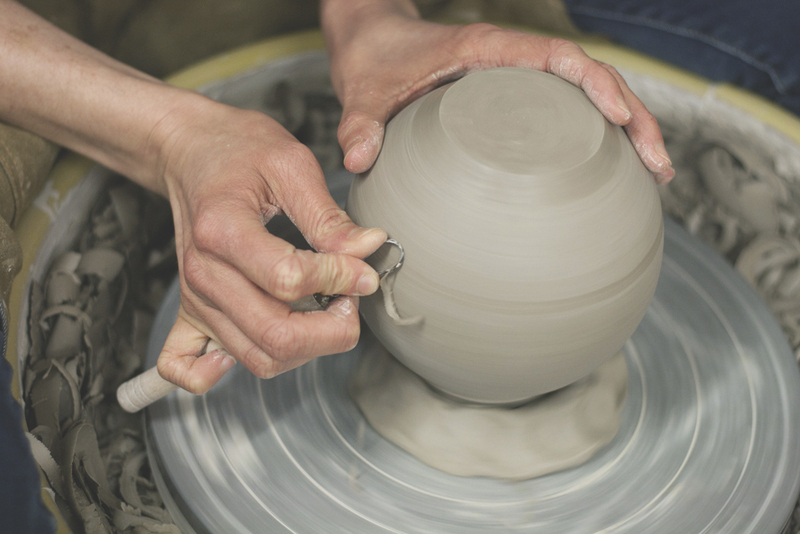 You mentioned that you fell in love with clay very early on – what fascinates you about working with this material? I think clay is a whole world that you get to explore in. I like its impressionable nature. Unlike, say, a painting, it gives me the liberty to experiment. If I am fashioning a piece and I decide ‘oh, I don’t want handles on it’, I just tear them off, smooth that area down, make adjustments as I’m going through the creative process. I also love how full of texture clay can be. You can stamp it with something and you could smudge out that mark, you can change it any tiny way, but as soon as it is fired, that is permanent. So you have this really interesting juxtaposition between soft, malleable, easily changed and moulded to concrete and permanent. And probably many of my pieces will outlast me. Because once they are fired they will literally be as permanent as what you see in the Ashmolean museum: they will be here for thousands of years. Where do you see yourself in the context of ethical consumerism? I think in a culture of so many disposable wares it is lovely to invest in things that will hopefully last you a lifetime. There is a beauty in that, it adds poetry to the ordinary traditions – the idea of having lovely objects join the everyday pattern of life. Also I think clay is a perfect medium to fit into that world because I love the fact that nothing gets wasted in the process. With clay, every left-over scrap can be softened down, turned into slurry and then used again. So there is zero loss, which is really great. Not all of what you create is purely functional. 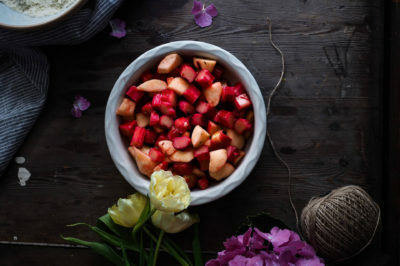 How do you get your ideas for what to make? A good example for this is my tree bowl. It was a motive that I developed in grad school. My father had just died of cancer and he was only 44 so that was a big life event for me. And one of my instructors just said ‘as painful as this is, you should bring this into your work, this is possibly the most powerful thing that you could put into your pieces’. At that time, I had been making mostly functional pieces. It took me a while to put all these ideas and feelings into clay. The bare tree motive is a way to present one of my father’s interests -he loved botany, and we often would do gardening together. It became a representation of him to me. And I hope objects like this will help to brighten a corner in somebody’s room. 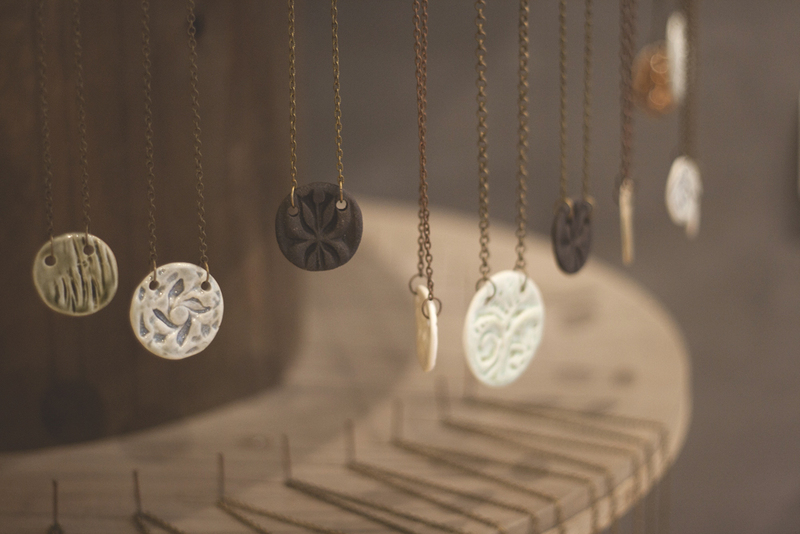 You also carry a few handmade goods from other makers in the UK. How do you select them? Occasionally people approach us. Our lovely soap-makers approached us first with samples of their soaps. We also sell hand-carved spoons and cards, and for these I looked primarily online – I would go on Instagram and hunt local makers down that way. 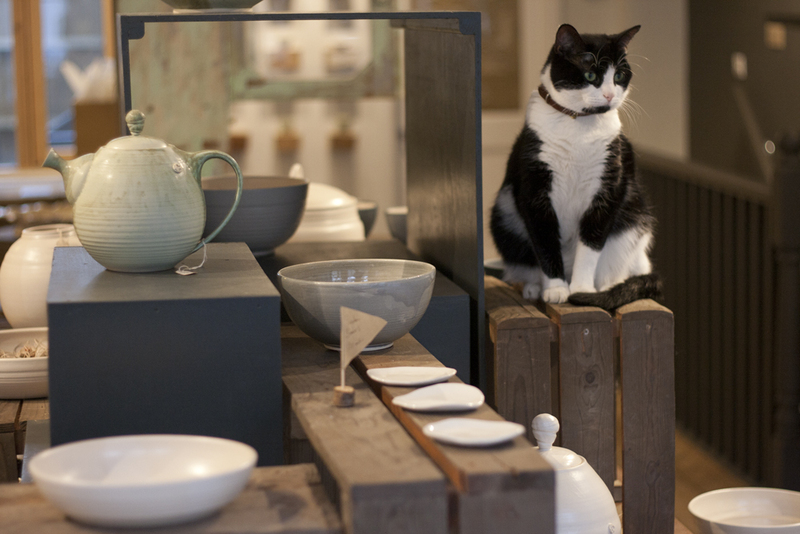 What makes your shop stand out is not only the beautiful pottery but also the fact that people walking past it are likely to do a double take because they can see a snoozing cat in the middle of a fruit bowl – I have to ask about your feline friend Lucie Maud! She is the star of the show! 2 Valentine’s Days ago I asked my husband for a cat. I wanted a little friend to keep me company down here in the studio while I worked, as I am frequently all by myself down here. So he had to search high and low in February to find a kitten – a bit early for cats! When she was a tiny baby I worked with her by my side, but now she much prefers being upstairs in the showroom. I can’t say she never knocks anything off up there, her track record is not completely clear. But she only ever breaks the small things, so that’s ok. She is very dexterous and since she grew up here she really knows her way around the objects. Do you have any for other makers who are dreaming about setting up a small business of their own? I would say to start in a small way so that you can experiment and get feedback. And if that is giving you the green light, then go for the next step. Just be wise in that realistic step-by-step process. You don’t have to take a huge risk up front. Just start making what you love, the way you want it, and then start presenting it to see if people are also loving it, or if they want you to do something slightly different. Stay small while you are developing your product and then, once you are confident you have a product that works, you can take those next steps. Doing it like that helped me to take a bit of the scariness out of it. And, I would also say, do use social media. Those tools are huge and free. If you can take a decent picture of your work, you can share it with the world and that is revolutionising the business world, big or small. It’s very exciting. 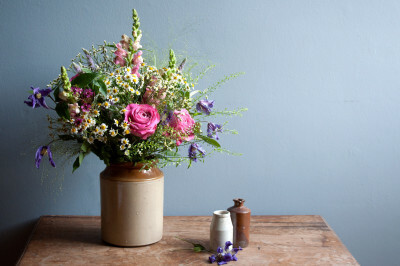 Find out more about Illyria Pottery by browsing Katie’s beautiful online shop and inspiring Instagram feed.